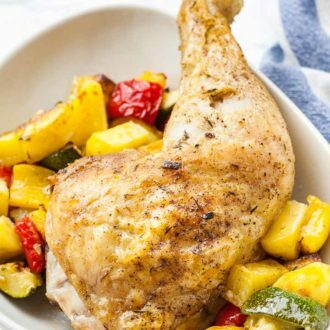 Oven Baked Chicken Legs with Potatoes and Vegetables are so easy to make with only a few simple ingredients and one sheet pan! These baked chicken thighs and drumsticks come out tender and juicy on the inside and crispy on the outside. Preheat oven to 390°F (200°C) and line a large baking sheet with aluminum foil. In a large bowl combine potatoes, zucchini, peppers, and onion. Set aside. In a small bowl combine garlic, olive oil, rosemary, black pepper, dried thyme, garlic powder, onion powder, paprika, and salt. Brush the chicken legs with the marinade then add the remaining marinade to the bowl with the potatoes and vegetables and mix with a spatula until everything is evenly coated. Spread out the potatoes and vegetables on the baking sheet and place the chicken legs skin side up on top. Bake for 45-55 minutes until the chicken is golden brown and crispy and has reached an internal temperature of 165°F.